Don't let today's warm weather fool you. Cold and snow are on tap for tomorrow. The front that's separating arctic air to the north vs. mild conditions to the south is right on schedule. Once the front crosses your area, expect temperatures to start dropping and continue dropping all the way through Tuesday morning. Rain has already broke out across much of the northern 1/3rd of the area. Expect this to continue and slowly edge its way south the rest of the day. Wind direction will switch around to the north as the front passes and allow temperatures to crash. For example, Luray was 60 degrees at lunch time with southerly winds. The front passed through and switched the wind direction to out of the north. At 2pm they were 43 degrees with rain. The profile will continue to cool until the entire layer is cold enough to change this rain over to snow north to south. Below is when I expect this to occur. Once snow starts, expect it to quickly start accumulating. There may be a brief period of sleet during the transition. Temperatures will continue to plummet throughout the day Monday. This isn't a storm you want to be caught out on the roads in, especially since the rain that initially falls will produce a icy layer underneath the snow. Below is my final call. Not many changes from my thoughts yesterday, although I did nudge things south a bit. 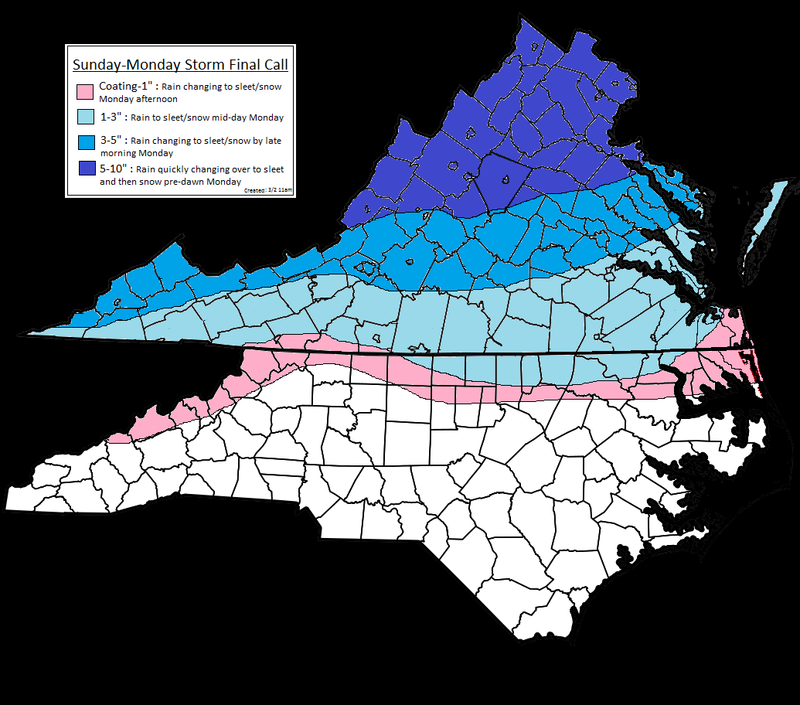 I think the Canadian model has been handling this system the best so weighted my map towards it. In my 5-10" area, I do think some locations will push a foot, but I expect that to be isolated. If I had to pick a jackpot zone right now it would be somewhere along the Blue Ridge Mountains between Harrisonburg and Charlottesville. Snow will end and things will clear out by Monday night. With snow pack on the ground and clear skies, temperatures are going to get very cold. I still expect some areas to get close to daily record low values. It's looking like we'll see widespread teens and single digits, with some higher elevations likely going below zero. There's been a lot of agreement between models concerning this the past few days. 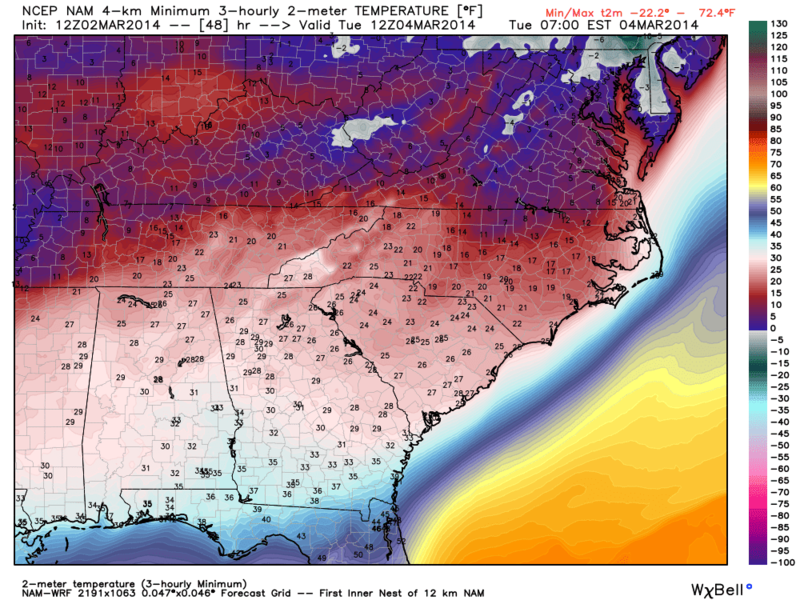 Below are the projected low temperatures Tuesday morning form the high resolution Nam.